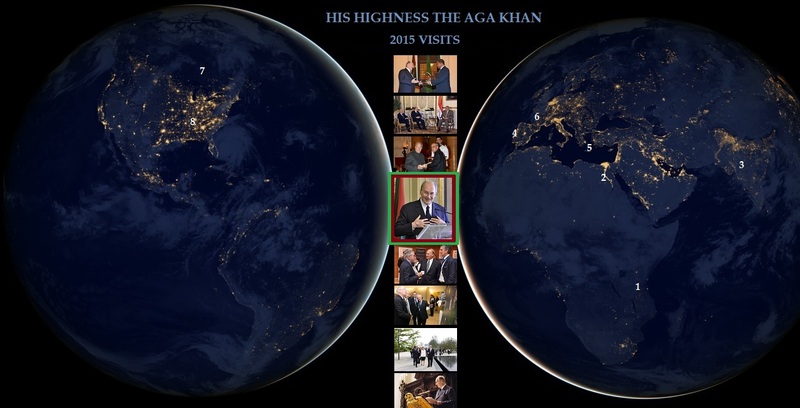 The 2015 Travels and Accomplishments of a Global Humanitarian and Spiritual Leader, His Highness the Aga Khan published on December 10. “Our central objective is to improve the quality of life for people in the developing world, and it is from this perspective that I will speak to you today. “Our work extends to 35 countries in fields such as education and medical care, job creation and energy production, media and tourism, the fine arts and micro-finance. We believe that by improving the largest numbers of variables in the shortest possible time, we can obtain stable, long-term improvement in the quality of human life. “Cultural heritage, of course, plays a central role in this endeavour. This focus was sharply intensified for me some 40 years ago when I came to realise that the proud architectural heritage of the Islamic world was progressively vanishing. The physical legacy of great Muslim empires was collapsing, and the response in the Islamic world seemed to be oblivion…There were no processes for revival, just the occasional misplaced dome or minaret. “Our time-honoured cultural heritage had been buried – obscured not only by the shifting sands of time, but also by an all-consuming occidentalisation. As one observer commented, the physical identity of the Islamic world had been reduced to coffee table books. “It was out of these concerns that the Aga Khan Award for Architecture was established in 1977, followed by the Aga Khan Trust for Culture and its Historic Cities Programme. “As our agenda grew over time – and most excitingly – we also came to another critical understanding. We began to see the added potential of heritage projects for advancing an economic and a social agenda, for fighting poverty and driving development. To be sure, this potential was often ignored as culture was too easily miss-labelled as a luxury amid pressing social and economic needs. “But my colleagues and I became convinced that cultural heritage projects are not a diversion from development priorities. Culture is in and of itself a development resource of immense potential value. “Some who share this view refer to cultural investments as a springboard for development. Similarly, I like to say that cultural heritage can be a trampoline, propelling dramatic improvements in the quality of human life. “I have seen this trampoline in action again and again. “One of my early such experiences came three decades ago at a conference on urban growth in Cairo, a city founded by my own ancestors 1,000 years ago. “As we looked out over medieval Cairo that week, one glaring anomaly stood out: a stretch of barren land, some 30 hectares, covered largely in heaps of debris. “What an amazing surprise – in a city that was 1,046 years old and as densely populated as Cairo – to find a site in its oldest area on which no building had ever been built! Even the famous Ayyubid walls, which once ran alongside this site were covered by 5 to 6 metres of waste. An aerial view of the Al-Azhar Park, a gift to Cairo by the 49th Ismaili Imam. When the city of Cairo was built by the Fatimids, His Highness the Aga Khan’s ancestors, 20 percent of it was devoted to open space, including a royal park and garden. But by the second half of the 20th century, as more and more people from rural areas moved into the city and new high-rise housing was built to accommodate them, it became one of the densest metropolises in the world. Photo/Caption: Aga Khan Trust for Culture (AKTC). “This rubble dump was a repellent deformity, but it was also a stirring opportunity. And the result was that on this forsaken site there was created a state-of-the-art green space: Al-Azhar Park. “Opened ten years ago, the Park has since attracted some 17 million visitors. Their access fees produce a re-investable annual surplus of some $800,000 US dollars. “But there is more to this story. View of a typical residential alley in Darb al-Ahmar characterised by poverty and building decay. Photo: AKTC. “Adjoining the park was one of Cairo’s poorest neighbourhoods – Darb al-Ahmar – its ancient ruins sheltering some 200,000 poor, marginalised inhabitants. Out of those ruins there grew a great archaeological adventure – uncovering and restoring ancient ramparts and gates, six historic mosques and dozens of houses and palaces. “From the start, the local residents were deeply involved in this adventure. They were trained in restoration skills, and some 200 are still employed in this initiative. Others were trained to support the site and to accommodate the flow of visitors. “The restoration project also included major improvements in local education and health services, in neighbourhood infrastructure, in vocational training, and microcredit initiatives. Left – One of the recipients of a micro-credit loan bought a stove to bake bread and produce hot meals for sale to workers and residents in the Darb al-Ahmar area. Right – A loan enabled this woman to buy a press to stamp metal components for nearby workshops. Photo: AKTC. “The result: family earnings there have increased one-third faster than in the whole of Old Cairo, literacy rates have climbed by one-fourth and today the whole area – once one of the most impoverished urban agglomerations on the planet – has become a remarkable residential, recreational and cultural site. “Similar stories can be told about other places in the developing world, where historic cities can be among the poorest, often serving as makeshift transition spaces from rural poor populations to becoming city dwellers. “At such a time – and on occasions such as this – it is important that we commit ourselves ever more ardently to the essential work of cultural heritage as a powerful contributor to improving the quality of life for the entire human community.” — Excerpts from His Highness the Aga Khan’s speech on the 50th Anniversary of ICOMOS, London, England, October 22, 2015. His Highness the Aga Khan shared his decades long experience as the 49th hereditary Imam of Shia Ismaili Muslims in an address he delivered at Harvard University on November 12, 2015 in which he focused on building a better world through the notion of the Cosmopolitan Ethic. In an analysis of the term and what it means to him, he also emphasized that it resonates with the world’s great ethical and religious traditions. The address that he delivered is one which every Muslim and non-Muslim should reflect on and hold true to their hearts because, as His Highness said, each one of us is born of a single soul. “…I would emphasise that a cosmopolitan ethic is one that resonates with the world’s great ethical and religious traditions. “At the very heart of the Islamic faith is a conviction that we are all born “of a single soul.” We are “spread abroad” to be sure in all of our diversity, but we share, in a most profound sense, a common humanity. “This outlook has been central to the history of Islam. For many hundreds of years, the greatest Islamic societies were decidedly pluralistic, drawing strength from people of many religions and cultural backgrounds. My own ancestors, the Fatimid Caliphs, founded the city of Cairo, and the great Al Azhar University there, a thousand years ago in this same spirit. “That pluralistic outlook remains a central ideal for most Muslims today. There are many, of course, some non-Muslims and some Muslims alike, who have perpetrated different impressions. “At the same time, institutions such as those that have welcomed me here today, have eloquently addressed these misimpressions. My hope is that the voices of Islam itself will continue to remind the world of a tradition that, over so many centuries, has so often advanced pluralistic outlooks and built some of the most remarkable societies in human history. Professor Diana L. Eck of Harvard University interviewing His Highness the Aga Khan following the Samuel L. and Elizabeth Jodidi Lecture, 12 November 2015. Photo: AKDN/Farhez Rayani. “Let me repeat, in conclusion, that a cosmopolitan ethic is one that will honour both our common humanity and our distinctive Identities — each reinforcing the other as part of the same high moral calling. Date posted: December 28, 2015. Its a pleasure to receive all the updated highlights shared upon individuals around the globe.